Welcome to the Ethos and Student Leadership page! At DGS we take immense pride in the ethos we create and promote every day. Leadership for girls is at the heart of the work we do here. When our students leave DGS they will be confident, compassionate and creative women who will shape the future in a way that empowers them. Our students develop their leadership skills in a variety of ways: from Year 7 to Year 11 we offer them an eclectic and exciting range of opportunities detailed below. At DGS, leadership is broad and it is inclusive. We want all our girls to be equipped with the ability to lead others, but more importantly, lead themselves. Personal biases aside, I feel that Leadership is one of the most exciting and invigorating aspects of school life at DGS! 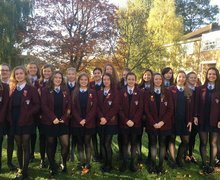 We have an exceptionally strong culture for Student Leadership at Didcot Girls’ School. In our day to day school life we create a range of eclectic and exciting leadership opportunities for our students, enabling them to become effective, inspiring and compassionate leaders in the world. At DGS Leadership is always wide-ranging, inclusive and accessible to all. Lower School Leadership Awards: Students work towards gaining their Bronze, Silver & Gold Leadership Awards. They can also work towards attaining their Platinum Award which involves a minimum of ten hours of community work. Upper School Leadership Awards: Students work towards gaining their Bronze, Silver & Gold Leadership Awards. They can also work towards attaining their Platinum Award which involves a minimum of ten hours of community work. School Councillors: represent the student body and organise events/initiatives throughout the school year. They lead their group in a national 'First Give' project when in Year 9 which involves researching a local charity and making a visit there. 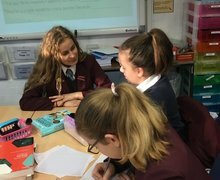 Ethos Leaders: a leadership opportunity in Year 10 to work alongside the Head of Ethos and take the lead on significant events throughout the year. Deputy House Captain (Year 10): a new and exciting opportunity that allows one Year 10 student per house to be a formal and fully-fledged part of the House Captain team. House Captains and Deputy House Captains (Year 11): an exceptional opportunity for Year 11 students to lead the school throughout the year. The House Captain team is appointed after a rigorous and robust interview process. Prefects (Year 11): a carefully selected group of Year 11 students with whole school responsibilities through the year. Subject Ambassadors: chosen independently by individual departments to represent their subject. Subject Mentors: chosen by individual departments to work with students from lower school on a one to one basis. Transition Leaders: appointed to enable the transition for Year 7 students to be smooth, productive and exciting. Design and Technology: Learning Champions to cascade their skills and knowledge to other pupils. Business Studies: Year 9 students organise a 3 day school Christmas fair, investing their own money in the enterprise. Psychology: Sixth Form mentors for GCSE students. Languages: Sixth Form helpers in Year 11 lessons and Language Ambassadors who promote Modern Foreign Languages around the school. Maths: 15 Year 9 mentors each term working with Year 7 students on Fridays as part of KS3 Maths intervention. English: Reading Ambassadors and mentors for younger students as well as a Poet Laureate each year.